So it happened that certain embedded YouTube videos on my site were not playing in firefox while running perfectly fine in other browser such as IE, Opera, Chrome and Safari. 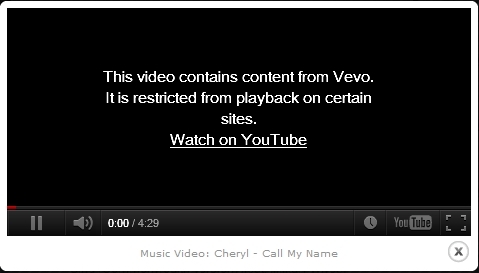 This video contains content from Vevo. It is restricted from playback on certain sites. Watch yon YouTube. To put it into picture, this is what I’m talking about. We know that the power players in the music/MTV related official videos on YouTube are controlled/regulated by power players such as Vevo, WMG and UMG etc. At first, I assumed that they’ve limited their videos to be watchable only on YouTube. But seeing that embedded videos do play in different browsers on the same computer, I quickly write off this case. Long story short, my embedded videos were not playing due to HTTP referrer not being sent to YouTube. I had an firefox extension installed called RefControl that’s used to control what gets sent as the HTTP Referer on a per-site basis. 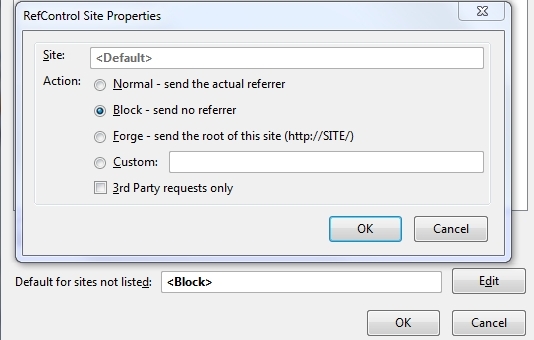 And purposely (or ignorantly), I had set RefControl long time ago not to send any HTTP referrer at all when requested. First, I didn’t realize that HTTP referrer would be the reason. But after disabling the RefControl extension or by changing the referrer value in the extension to a valid HTTP url, YouTube videos started to play miraculously in Firefox once again. There could be other reasons why embedded youtube videos aren’t playing on your site, the best official explanation I’ve found is this. But in my case discussed in this post, it was all due to no valid HTTP referrer sent when the video was requested. I found it out the hard way. Say thanks if this helped you. Ohh, thank you SO much. I had been looking for a solution to this problem. Hi, I am using Ionic framework to create a mobile app. I used embedded youtube in my applciation. I have the same problem. Since this is a mobile app, how can I get it to work in this case? did you found any solution for this ? struck on same place .